The Indian Peaks Wilderness is a wilderness area in north central Colorado managed jointly by the United States Forest Service and the National Park Service within the Arapaho and Roosevelt National Forests and small parts of the southern section of Rocky Mountain National Park. It borders the James Peak Wilderness to the south, and straddles the Continental Divide. The area receives high visitation due to its proximity to the Denver metropolitan area. The area encompasses a stretch of the Front Range. It includes 7 peaks over 13,000 feet (4,000 m) in elevation. 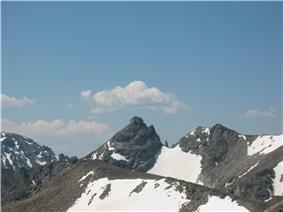 The highest point is North Arapaho Peak at 13,502 feet (4,115 m). The peaks are all within 100 feet (30 m) of elevation of each other. A portion of the area, encompassing the headwaters of North Boulder Creek, is closed to the public as it is the City of Boulder watershed. Indian Peaks were formed in one of World's largest eruptions known during Mid-Tertiary ignimbrite flare-up. Many of the peaks inside the wilderness area are named after western Native American tribes. The naming scheme was the idea of botany teacher Ellsworth Bethel. By 1914, few of the peaks between Longs Peak and the Arapaho Peaks had names. In the spring of that year Bethel, inspired by the established name of the Arapaho Peaks, settled on 11 tribal names for various summits along the Divide. 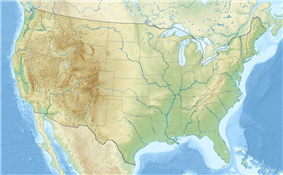 The United States Board on Geographic Names kept 6 of his names: Apache Peak, Arikaree Peak, Kiowa Peak, Navajo Peak, Ogalalla Peak and Pawnee Peak. He later added Paiute Peak, as his use of the Ute band was denied due to too many other Colorado features sharing that name. Other names, including Shoshoni Peak, Hiamovi Mountain, Satanta Peak and Watanga Mountain were added later. 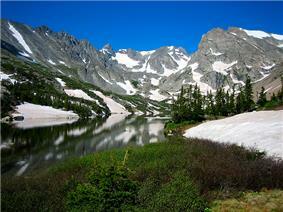 The Indian Peaks were visited by Native Americans for several thousand years. The Arapaho tribe lived and hunted in the area during the summer months, though little evidence remains of their activities. Mining took place in the 1870s near the Arapaho Peaks. Later, a road was built to Arapaho Pass but never completed. The mining turned up little more than low-grade ore, and the mines were eventually abandoned. Remnants of mining activity is still found along the Arapaho Pass trail. Arapaho Glacier (now owned by the city of Boulder) is one of a few glaciers still left within the Indian Peaks Wilderness, but, being a part of Boulder's watershed, is off limits to hiking/camping. Several glaciers however, are still hikable and there are a number of routes to take. One set of glaciers, the Isabelle and Fair glaciers have a connecting trail that will send you over the Continental Divide. Isabelle & Fair glaciers were discovered by Mr. Fair in 1904 and were given their names by Prof. Junius Henderson, formerly of the University, who made a study of the glaciers in 1910 at Mr. Fair's request. Mr. Fair believed that water sometime would be run through a tunnel from the Western Slope into Four Mile canyon, that Boulder and the mountain region would continue to grow in popularity, that some day Boulder will have to build a storage dam lower down that those in the Arapahoe glacier region and that a road to the Arapahoe or some other glacier will be constructed and become the most popular drive in the state. The Denver and Interurban Company, which operated an electric line between Boulder and Denver for many years adopted the name "Glacier Route" at Mr. Fair's suggestion. The figure 8 trails in the Arapahoe and Buchanan pass areas were made largely on the suggestion of Mr. Fair. A plane crash from the 1940s exists on Navajo Peak, not very far from the summit. The area of the Indian Peaks was included in Enos Mills' original proposed boundaries for Rocky Mountain National Park. They were removed from the proposal after compromising with local and mining interests. Park superintendents tried to annex the Indian Peaks over the years, but the area would not receive protected status until 1978 when Congress designated the Indian Peaks Wilderness Area. Most visitors hike along the many trails, visiting high passes, lakes and waterfalls en route. The area also contains many notable mountaineering routes. The busiest area is Brainard Lake, which hosts several trailheads and a campground. Fishing is also found in many of the lakes and streams within the wilderness. In the winter, snowshoeing and cross country skiing are popular. Mechanized recreation, such as mountain biking and the use of motorized vehicles, is prohibited in the Indian Peaks Wilderness. View SE from the saddle between Hiamovi Mtn. and Mt. Irving Hale.